ONE REASON players struggle with a particular shot is because they are, as I like to call it, entering, as I call it, "the land of the unknown." When you're up against an unfamiliar situation, you're likely to miss because you can't trust your fundamentals and your stroke. This month, I want to discuss shots where the cue ball is frozen to a rail - a situation that can be terrifying for developing players. But with a little practice, you shouldn't have any reason to fear. Back when I was practicing 12 hours a day, seven days a week, I had a coach show me this exercise. It is really built a foundation for me, to the point where I would go months without missing a shot with the cue ball up against a rail. 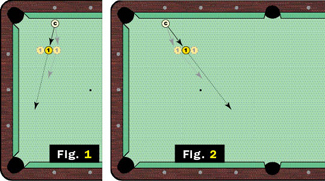 As you can see in Figure 1, freeze the cue ball to the long rail against the first diamond from the corner pocket. Now, in a direct line to the opposite corner pocket, place an object ball about a foot from the cue ball. Drill this shot until you feel like you can't miss. When you're able to make it multiple times in a row, start to move the object ball - first to the right, then to the left. Create an angle so you can get a feel for cutting the ball to the corner pocket. Now, when cueing the ball off the rail, it's important to remember a few things. First, the rail prevents you from keeping your cue totally level, so you have to hit at an angle. Because it can be uncomfortable, players have a tendency to bring the cue back at one angle and then stroke forward at another. Keep it consistent. Secondly, never use English when you're in this spot. The shot is difficult enough, so stick to hitting the ball on its vertical axis. Once you get a hang of the shot into the corner pocket, try the shot in Figure 2. It's the same setup, only now your going from that first diamond to the side pocket. You'll be surprised how quickly you'll get a feel for these shots.